Ghost Rider & the X-Men descend on New Orleans to discover the Assasins Guild has been taken over by the Brood. In New Orleans, a member of the Assassins Guild kills one of the Thieves Guild, the latest in a string of such murders, attracting the attention of Ghost Rider. 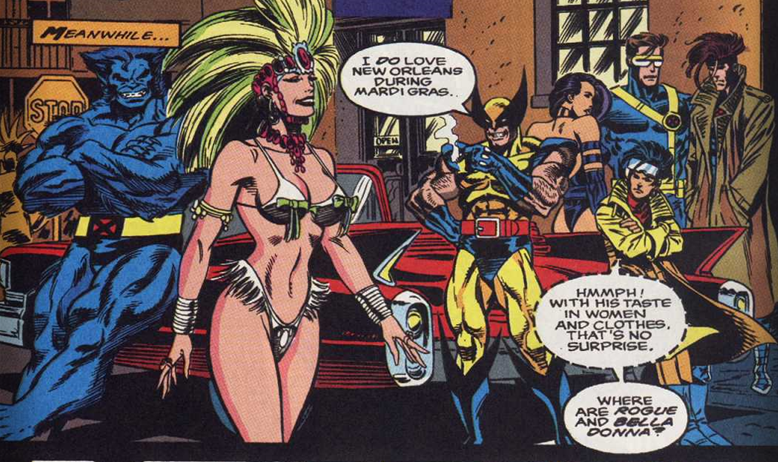 Meanwhile, the X-Men arrive in the city along with Bella Donna. Tracking the assassin, Ghost Rider interrupts another attempted murder, and chases the assassin into the catacombs under the city, where he finds a group of Assassins who have been taken over by the Brood, and is captured by the Brood Queen. Later, the X-Men pick up the trail of the thieves' murderer and follow it into the same catacombs, encountering the Brood as well. 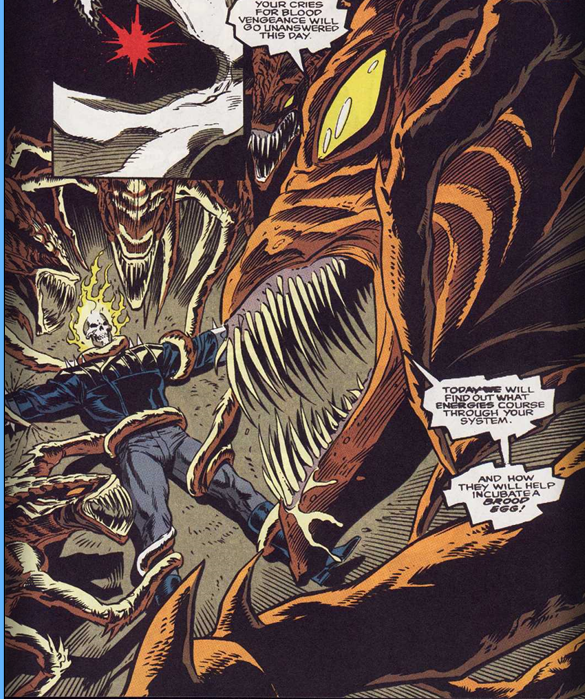 The X-Men attack, but are horrified to learn that Ghost Rider has been infected as well. This is the second part of a four part crossover between X-Men and Ghost Rider. Usually, if not prompted by a single creator (like Peter David's "War and Pieces), this kind of thing is usually motivated by a desire to use a popular character(s) to boost sales on a lesser title (or shore up a newer one), but at this point in 1992, it's hard to say who was being used as the booster between the two, with both the X-Men and Ghost Rider being ridiculously popular at the time. 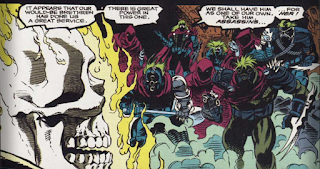 The Brood are revealed this issue to be the central villains of the story, having taken control of the Assassins Guild by using them as host bodies. It marks their first appearance since Uncanny X-Men #232-234. This issue gives us our first look at the Thieves and Assassins Guilds mentioned in X-Men #8. Both groups seem to have super-powers (it's said that every thief has a special power of some sort), and the Assassins Guild are presented as having a general look of a black bodysuit (including a face covering), cape, and green hair, which will remain relatively consistent in future appearances (excluding some specific members, like Bella Donna). The masked, shadowy assassin seen in this issue (and the next) who is killing the members of the Thieves Guild will be revealed in Gambit's first solo limited series to be Bella Donna's brother Julien, whom Gambit, at this time, is believed to have killed (prompting his running away from the Guild business and leading to his hooking up with Storm, and then the X-Men, per X-Men #8). Howard Mackie writes both this issue and that series, and given how the assassin talks about the thieves and blood feuds and whatnot, it seems like this is something he had in mind writing this story, even though it doesn't get revealed until later. Ghost Rider is in New Orleans seeking the help of Johnny Blaze, the original host of the Ghost Rider (from the characters' earlier 70s series) because current Ghost Rider host Dan Ketch was killed in the previous issue by Blackout. Blaze will show up in the next issue. This story takes in New Orleans during Mardri Gras, as all stories set in New Orleans must be. And speaking of New Orleans, this story is also somewhat infamous for setting much of its central action in the catacombs beneath New Orleans (here, it's where the Brood are living), catacombs that don't really exist considering that the city is basically built on the bottom of a bowl with water surrounding it all sides, a geographic detail that, in fairness, was much less obvious to the average person in 1993 than in our post-Katrina world. 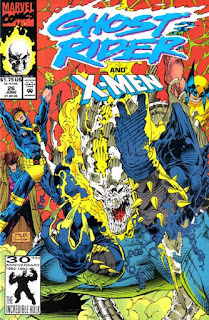 Jim Lee draws the cover for this issue (suggesting that, at least if the X-Men weren't the more popular draw between the two characters, Jim Lee definitely was). The X-Men are without their Blackbirds (as mentioned in X-Men #8), causing them to fly coach then rent a car. I'm not entirely sure what this is adding to the story, but I at least appreciate an explanation for why they couldn't just fly in a Blackbird. 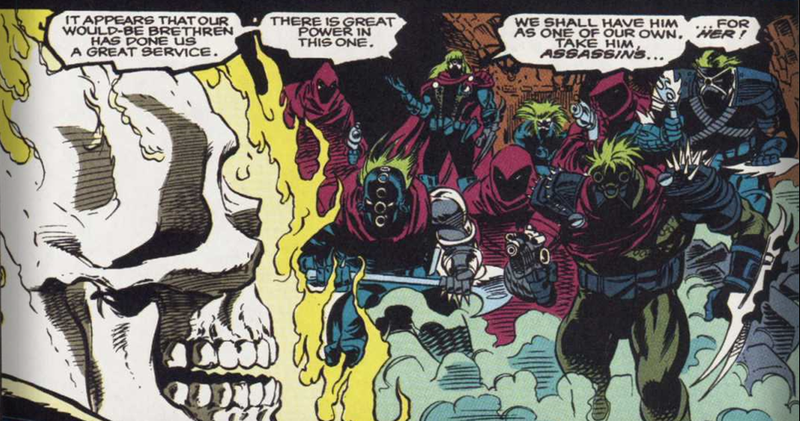 Ghost Rider references having descended to Hell, as seen in Hearts of Darkness. The X-Men warn that once a Brood takeover a host, the host is functionally dead even if their body remains intact, and that's it's best to consider the person gone at that point, despite the fact that certain of their members have come back from Brood possession on several occasions (and, of course, Ghost Rider will be freed of that possession in the next chapter of the story). Though the title on the book is different and a decent chunk of the story is told from Ghost Rider's point-of-view, this is still very much an X-Men story, following on fairly directly from the conclusion of X-Men #8. There's a little bit of time spent on the current status quo of Ghost Rider, specifically the state of Dan Ketch and Ghost Rider's search for Johnny Blaze (which will factor into the story's conclusion), but even the stuff Ghost Rider deals with directly is tied to the X-Men: he's drawn into the conflict between the Thieves and Assassins Guilds, which in turns end up being exacerbated by what is chiefly a X-Men villain in the Brood (I don't even think any other characters have encountered the Brood at this point). Which is all well and good for readers coming to this story as X-Men readers, but is probably a disappointment for regular Ghost Rider readers, and also seems like a curious decision if the goal was to port over some X-Men readers to Ghost Rider, since there's really very little to give any such potential new readers a sense of what a Ghost Rider comic would normally be like. Tomorrow, Wolverine and Nightcrawler reunite in Marvel Comics Presents #101-108. 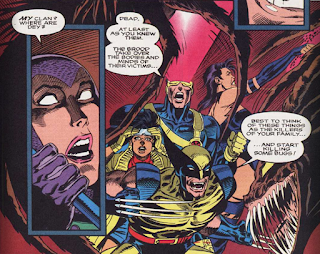 Next, the X-Men fight Brood Rider in X-Men #9. Even though I've read the X-MEN parts of this crossover, and even though I own the full thing in collected edition format, I don't think I've ever actually read the GHOST RIDER issues. Not sure why that is. I mean I've never been a big Ghost Rider fan, but you'd think I would've read it for the X-Men connection. Anyway, Ron Wagner's work here is a lot more appealing to me than his brief time on EXCALIBUR a few years earlier. I don't know if it's the different inker or what, but I like this much better. On the writing front, I've always found it odd that Howard Mackie did both GAMBIT mini-series and the ROGUE mini-series as well when he really had next to nothing to do with the X-office until he eventually joined X-FACTOR years later, but I guess the genesis of those jobs is right here. He must have really been invested in all the Thieves/Assassins stuff. I'm kind of surprised he never used them in SPIDER-MAN at some point! Hmm, you may be thinking of the notorious "Façade" storyline from WEB OF SPIDER-MAN, which came just before the "Clone Saga" and did indeed guest-star Gambit and the Black Cat -- though it was written by Mackie's successor on WEB, Terry Kavanagh. In any case, having only read that abomination one time when it was first published, I honestly can't recall whether the Thieves' Guild factored into it at all. "I don't think I've ever actually read the GHOST RIDER issues." I have, but I may as well have not, because I barely remember them. It never really clicked for me before that Mackie wrote both this and the first Gambit LS (I've probably only read it once, if at all). I remember thinking it was odd that someone outside the X-office (at the time) dove so deep into the Guild mythology with this story, but now I see it's more that Mackie is pretty much responsible for creating all that mythology in the first place, starting here and continuing into the Gambit series. Like with Knightboat there is always an inlet, canal or fjord, with Mackie there's always miles of catacombs under the city. For potential GHOST RIDER readers, if they'd only get curious to buy the very next GR issue #28 following this crossover, they'd be there for the Part 1 of Rise of the Midnight Sons, the Ghost Rider specific crossover that saw the launch of SPIRITS OF VENGEANCE, MORBIUS, DARKHOLD: PAGES FROM THE BOOK OF SIN and NIGHTSTALKERS titles, all helpfully listed on the opening page therewith. In somewhat funny move, the crossover kicks in in GR #28 only to give room for further unrelated Wolverine and Beast guest-starring in GR #29 in a story I so do hope you will be X-amining because it will address a matter closely related to the X-world. Thinking of it now, this all has "marketing department" written all over it. Good point about the series being on the brink of launching it's own franchise - that definitely does make this seem more like a story designed to bring X-MEN readers to GHOST RIDER moreso than the other way around. "The Brood are revealed this issue to be the central villains of the story"
Did they ever mention where this group of Brood came from? "This issue gives us our first look at the Thieves and Assassins Guilds mentioned in X-Men #8"
"Jim Lee draws the cover for this issue"
Not one of his better ones, if we're being honest. "The X-Men are without their Blackbirds (as mentioned in X-Men #8), causing them to fly coach then rent a car. I'm not entirely sure what this is adding to the story, but I at least appreciate an explanation for why they couldn't just fly in a Blackbird." In costume, no less! Did they fly in coach that way? Did they change into their costumes after the flight? After they rented the car? This isn't great, but considering the era it is from, it could have been much worse. Not in this issue, certainly, and not really ever in the story IIRC. There's some business about them being attracted to the kids of the Guilds because they've been programmed such that they'll make good hosts, but that's about it. Did they fly in coach that way? Yeah. Probably it's greatest sin is being mediocre, being neither good nor bad enough to merit much reaction. How the Brood have fallen. They were the principle villains in some really good X-Men stories. I'd forgotten they were even in this one. I did manage to pick this one up for the X-Men connection. Meh. The nice thing about their use in this story is that it's easy enough to forget. I suppose the Brood were due at least one low-impact story, and this could be worse, but you're right that they've definitely dropped off from the menace they were in previous stories. I don’t really care for this cover but I’m fairly captivated by how much better that X-Men logo is than the grossly stretched version currently on the series’ own covers. Since the whole Midnight Sons line, which Teemu mentions, hadn’t spun out of Ghost Rider’s popularity just yet I’d assume that if you have to choose one option it’d be X-Men helping out Ghost Rider. Marvel could’ve been trying to gauge how much overlap and/or daylight there was between X-Men readers and Ghost Rider readers, however. No appreciable bump in either series might just as easily mean fans couldn’t or didn’t want to break down and buy all parts of the crossover as that they were already buying both series, although this era was pretty much the height of readers being such completists, but an uptick in both series would definitely be a signal to schedule more such crossovers in the future. 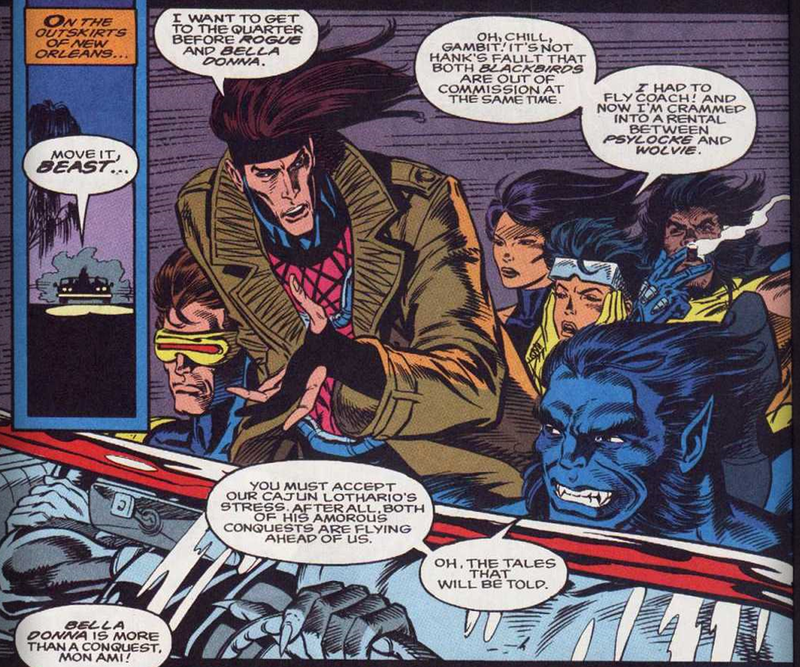 I’m hoping they aren’t necessarily all mutants, since it avoids a retcon nearly on the order of the Morlocks and Genosha in terms of being a large faction of mutants we rather impossibly haven’t seen so much as referenced until now, but that begs the question of how the groups do end up consisting largely or wholly of powered individuals. Pretty much all I know about Gambit’s background is what I’ve read for this series of posts, but I read and watch plenty of fiction, so just based on that I’d been assuming it was either him or, failing that, one of Gambit’s own brothers turned against his own guild after having been left for dead or whatever. Also: The casual, grisly murder of a pregnant woman — and specifically for being pregnant, with the child of the man who was the assassin’s primary target — is sadly pretty ‘90s. Actually... the Marvel Age Special Ghost Rider and the MIdnight Sons Magazine sheds some light what was happening around that time. According to the editor Bobbie Chase the Dan Ketch Ghost Rider was an unexpected hit and much sought after for guest-starring by creators on other books. They were looking for starting a second GR title, Mackie suggested separate BLAZE series but Chase got even more ambitious and wanted to resurrect the horror characters from the 70s into a family of interacting books not unlike the X-family setup. 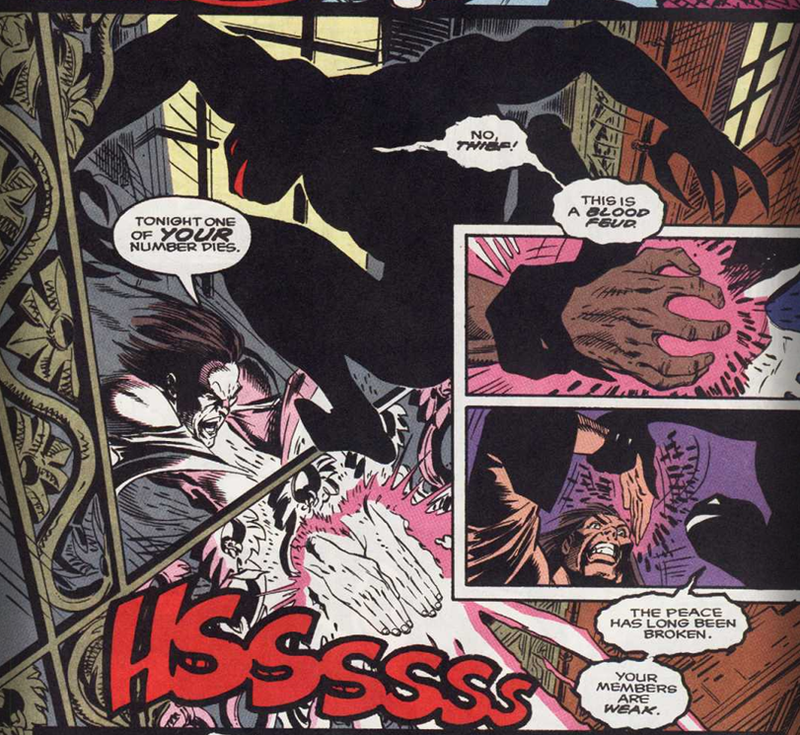 Bob Harras suggested Blade and Hannibal King from TOMB OF DRACULA, but because of being too busy couldn't write BLADE so they got Dan Chichester to submit his proposal which amounted to NIGHTSTALKERS. It may well be Bob Harras just was already invested enough to the project for this crossover with the GR main title to make enough sense at the time. GR #25 already was plastered with one-page ads of the new Midnight Sons titles. I have to say I find it absolutely beautiful that they could and would just kick up a family of titles that interact and crossover like Midnight Sons or Marvel UK. They may just have overestimated the capabilities of the fan's wallets. And of course D.O.A., the occult department of AIM with their supervampiresoldier schemes surely doesn't make quite as convincing villain as Dracula. Or, gnah, the youngified board of Mys-Tech. Personally I'm inclined to think it was the stupid useless 90's villains that got the whole thing collapsed. If you can't write the heroes, then make the villain intriguing. Still in the 2010's it was the stupid pre-production idea of Dr. Doom being a hacker kid with pretentious handle that got the Fantastic 4 flick, ha, doomed for good. @Teemu: I have to say I find it absolutely beautiful that they could and would just kick up a family of titles that interact and crossover like Midnight Sons or Marvel UK. They may just have overestimated the capabilities of the fan's wallets. We are deep into the Mighty Marvel Age of Glutting the Market at this point. We've already got the X- and Spider-books, soon the Midnight Sons and Marvel UK, as you mention will join them. Punisher is pretty much his own family of books already and he'll soon get another title added, plus there's the "Big Guns" "family" of loosely affiliated books (NOMAD, CAGE, SILVER SABLE AND THE WILD PACK, etc. ), all the tie-ins related to the INFINITY series du jour. On the one hand, the market was booming and I get the desire to pump out as much product as possible to capture as much of it as possible. On the other hand, "quality" is a finite resource, and even without the inevitable bubble burst, churning out a ton of poor-to-mediocre content is a recipe for disaster. But honestly, I think the worst thing to come out of it all is the way the "family of titles" mentality led to the terrible post-DeFalco decision of eliminating one central Editor-in-Chief in favor of five theoretically-equal EiCs, each in charge of a separate family. Oh, yes, it's hard to read Bobbie Chase's take of it and not immediately think of the family EIC setup happening right here. But, specifically, unlike the X-books or Spidey or, to an extent, Punisher, which took some time for their growing, these two families of books I mentioned seem to have been all put out almost overnight. * "Ok, listen up, we'll start four new books. The first book is like this: ... The second book is like this: ..."
Back in the early days of Marvel they might occasionally do one book like this. With 20/20 hindsight that was some sweet sweet hubris, but I don't know, it must have been damn exciting around that time there and it wasn't just the Image guys up to it. Of course you're absolutely right in that quality didn't match the eagerness. The delivery too often feels so paint-by-numbers-the-90's-way. But when you stop to think about it... bringing back TOMB OF DRACULA, Morbius, Darkhold, the original Ghost Rider, that's some genuine vintage stuff. (It's kind of funny that HELLSTORM, who technically started as GR supporting character somewhat missed the party.) Maybe it was for the fact that it was a T2 world now and not a Hammer Films one led to poor creative choices. About worst things to come out of it, under its needless 90's fluff DARKHOLD managed to build to pretty damn impressive twist ending in very historically appreciative Marvel way, but being marred with the other so-so 90'sriffic nonsense for sixteen or so books in the meantime before cancellation it all ended up being rather hastily sorted out and wrapped in one unmomentous DR STRANGE issue sometime year and a half later. There were some great ideas here and there, but everything somehow got sidetracked because someone apparently felt that every story needs more Cable. * I now notice in both cases it was prompted by Ghost Rider and Death's Head II initially getting some success. There's something similar in these 90's ubercool scully memory-challenged legacy characters who both have a weapon that transforms at will. But, what the hell, X-Men?! Blowing up the police car because "it's got a radio", after you already got the tires slashed and everything? Great job making the society hate and fear the mutants less, heroes! This is why you don't hire thieves. Yes, the police appears to be a bigot, it's not like we haven't seen these kind of on-panel encounters usually end with a picture of the stopped car speeding away from the officer's plasma-charred corpse. Oh, and on the subject of open net joke opportunities: if you're somethingsomething Rider going to New Orleans for the Mardi Gras, you'd better deliver. I mean, like, you get your motor runnin' and head out on the highway... it should be Avenger you're looking for and not a former Champion.